Snail mail may not be the most popular means of communication, but it's not the Pony Express! I know it's not the most preferred way to send messages, especially by the younger generation, but there will come a time when it has to be used. I noticed that the simple task of addressing envelopes isn't something that students are very familiar with, if they know anything about it at all! routinely say it or key it in. Knowing one's address and how to send something via the post office are basic knowledge that everyone should have. Let's keep everyone a little safer and teach them these vital facts! This product is perfect for kids in grades K-3. 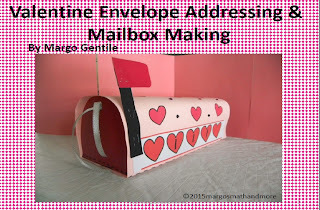 Not only will the students know their addresses and how to address an envelope, they will enjoy the fun "game" provided and make their own mailboxes.